In the native plant garden, August is a transition month between mid-summer growth and fall colors, flowers, and seed heads. Garden tasks are weeding, planting, trimming along walks and garden paths, collecting seeds, edging, and monitoring plants and pollinators. Plants are at full height and flowers are everywhere! In native plant gardening, weeds are defined as “plants not of a place.” In any particular region, plants endemic to that area are incorporated into native plantings based on site conditions—aspect, soil type and conditions, shading, topography, and other features. Weeds in name alone. Despite their names, these native plants are valuable and attractive in different garden situations. Butterflyweed (Asclepias tuberosa) and dyer’s-weed goldenrod (Solidago nemoralis) are relatively short plants for dry to dry mesic sites in full sun. Both reproduce and spread only by seed. Thimbleweed (Anemone virginiana) grows well in semi-shaded sites and can tolerate dry conditions. Tall plants—rosinweed (Silphium integrifolium), Joe-Pye weed (Eutrochium sp. 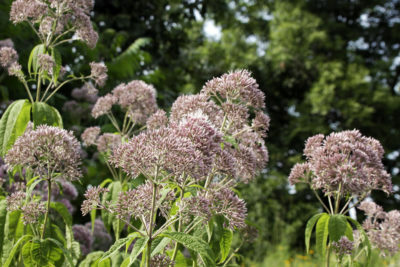 ), and ironweed (Vernonia fasiculata)—continue blooming this month, with yellow, pale pink or white, and magenta flowers, respectively. Up to 4 feet in height, sneezeweed (Helenium autumnale), with distinctive yellow flower heads, thrives in mesic to wet-mesic soils in full sun. Unlike the perennials above, jewelweed (Impatiens capensis) is an annual which can be abundant in wet years or on wet sites but does not grow well under dry conditions. Its abundance does not mean it will “take over” an area. It can be pulled easily if in the way of planting other plants, but left as a tall but impermanent ground cover otherwise. Weedy native annual plants. These plants are found in highly disturbed areas and easily managed by pulling or mowing. Horseweed (Conyza canadensis) can grow to 5–6 feet tall. It has tiny numerous flowers. Like horseweed, native ragweeds (Ambrosia trifida, Ambrosia artemisiifolia) have relatively small root systems, rapid growth, and are responsible for late summer allergies in August. Non-native weeds to avoid. Bindweed (Convolvulus arvensis), a perennial herbaceous vine, has deep rhizomes. It twines around taller plants in sun or partial shade, sometimes covering several plants as it keeps pace with the growth in an area. We’ve found that even with careful site preparation, it can be difficult to remove it from an area prior to planting. We deal with it through repeated weeding. Goutweed (Aegopodium podagraria) is a non-native groundcover plant from the carrot family that can be a problem mostly in shaded gardens. We’ve removed patches of it from our garden through deep digging and thoroughly removing root material. Spotted knapweed (Centaurea stoebe), anotherperennial true weed of dry areas and soils, can be controlled on a small scale by digging at least 3 inches of its taproot. A larger infestation may call for biological or chemical control. Annual weeds like stinkweed (also called field pennycress, Thlaspi arvense, in the mustard family), grow readily in disturbed areas. Control measures include harvesting and bagging plants before seed pods mature and digging first year rosettes. Plants like this one grow and set seed very rapidly, so manage patches before they add to the weed seed bank. Native plant gardens and ecological restorations follow nature in diversity, form, growth, exuberance, and constant change. Let this shift the way we consider “weeds” and garden wildness.